Suki. . Wallpaper and background images in the Avatar: The Last Airbender club tagged: avatar the last airbender airbender avatar toph katara last screencap aang. This Avatar: The Last Airbender photo contains anime, grappig boek, manga, cartoon, and stripboek. There might also be zonsondergang zonsopgang, zonsondergang, and zonsopkomst. Umm...not really. 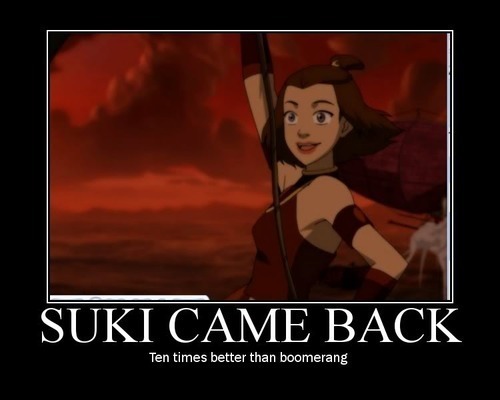 >.< Forget Suki, boomerang HAS to come back. Yeah...I feel for Sokka cuz his 'space sword' and his boomerang are gone. Like, yah I know losses happen, but seriously? Boomerang? I MISS SPACE SWORD AND MR. BOOMY!!! !